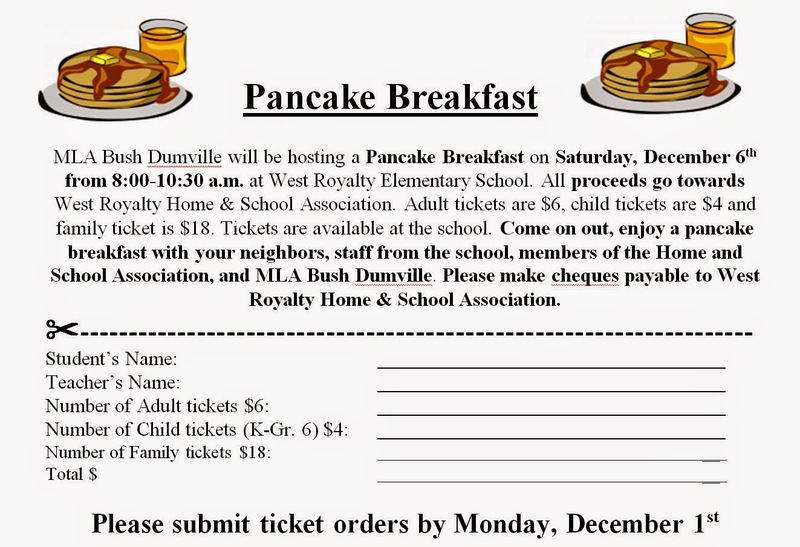 Flyers were sent home recently for a Pancake Breakfast on Saturday, December 6th from 8:00-10:30 a.m. at West Royalty Elementary School. This event is being hosted by MLA Bush Dumville with ALL proceeds going towards West Royalty Home & School Association. Come on out, enjoy a pancake breakfast with your neighbors, staff from the school, members of the Home and School Association, and MLA Bush Dumville. Tickets: $6 for adults, $4 for children and $18 for a family. Tickets are available at the school. Please make cheques payable to West Royalty Home & School Association. Ticket orders must be submitted by Monday, December 1st.